Aluminum grating is a frame made using alloyed aluminum bars, sheets and meshes that create a porous grid to be used for a variety of industrial, commercial and domestic purposes. For drainage, support, filtration, partition and enclosure formation, gratings are employed in many different environments and may be constructed of a number of different materials such as stainless steel, iron and brass. The beneficial attributes of aluminum and its alloys, however, make it a popular material choice for grate construction. 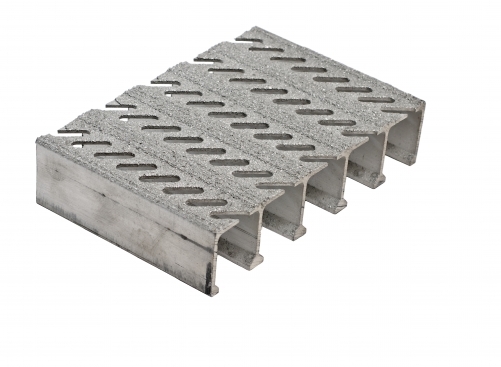 Extreme malleability, corrosion resistance, ductility, strength and thermal and electrical conductivity make aluminum grates useful in a number of industries which include heating and cooling processes such as food and chemical processing, architecture, waste water treatment, paper milling and marine superstructure. While strength and corrosion resistance are common attributes of many metal grates, aluminum is also light weight, non-toxic, non magnetic, resistant to bacteria sustaining particles and has the ability to withstand very cold temperatures. These properties make aluminum grates superior to other metallic options which may possess some, but rarely all of these qualities. In cooling applications for example, most metals become brittle, but aluminum actually gains strength when exposed to cold. An aesthetically pleasing metal, aluminum grates can be both functional and decorative elements utilized in traditional grate formations such as I-bar, rectangular bar and plank as well as intricate designer arrangements. Also spelled aluminium, it is one of the most abundant metallic chemical elements found in the Earth’s crust and the third most plentiful of all elements. Its strong affinity to oxygen, however, makes its free form presence rare in nature. Instead, aluminum is extracted from ores such as bauxite using the Hall-Heroult method. While the mining and refining of this metal can be difficult, it is easily manufactured and 100% recyclable without any loss of its natural qualities. Recycled and newly extracted aluminum can be processed with a number of methods to manufacture architectural grates. Often, extruded aluminum stock shapes such as bars, rods and sheets are little altered from this preformed state with secondary operations such as welding; that are used to create the grate. Welding is most popular for bar grating, while expansion grates stretch perforated aluminum sheets to create the desired hole size and shape. Swaging, pressure-locking and riveting are common production methods for aluminum and other metal grates. In some instances, bars are added to mesh or sheeting to provide additional support. Serration or non-slip coatings are often utilized for floor gratings made of aluminum. While finishing and supplemental support are important, additional considerations include the size, shape and density of the holes or gaps in a given grate as well as connection size. These help determine what can pass through the grate and at what rate. Aluminum Grating Aluminum grating is a frame made using alloyed aluminum bars, sheets and meshes that create a porous grid to be used for a variety of industrial, commercial and domestic purposes.